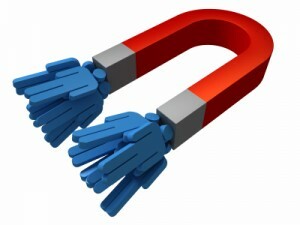 Attraction marketing, as the name suggests, is a way of attracting customers to you, rather than you going after them. The attraction process involves providing information to prospective customers about how it will be beneficial for them, to deal with you. The focus is not mainly on promoting a product, but rather building your brand value. You, and the services and solutions, you are going to provide are the main attracting factors. Creating your brand value is the mainstay of network marketing, and therefore almost all successful marketers are using some form of attraction marketing. Implementing attraction marketing is much easier on the Web, and it has become the main technique of successful home entrepreneurs. Web 2.0 technologies have provided many tools for the enterprising marketer to make the most of attraction marketing. Older techniques only involved setting up of a website with a marketing pitch, in the hope of getting visitors to buy the product or subscribe to the service. Now, with attraction marketing, a targeted crowd of people is eager to visit the particular website. This means they are already pre-sold on the concept, and the visit will be mainly to buy or subscribe to the service. All this seems like a dream come true for any marketer, but the question remains, how does one attract prospective customers to take the desired action. Here are some of the main methods used in attraction marketing, which have been proven successful. People are mainly interested in subscribing to a person rather than the services or products he or she might be offering. You are the person who will be introducing prospective people to the program or service, and hence people should be first attracted to you. This is where you make the most of social media sites, and blogs. Create a powerful profile on Facebook, Twitter, and your personal blog. These will be nodes from where you will be interacting with people, and first impressions are always important, and hence a good profile or bio page. People should know you as a person who can provide them with solutions and guidance. To give them a taste of your worth, provide free information or entertainment, in the form of digital products like ebooks, games, video tutorials, useful software, or apps and so on. Free stuff is used a lot in attraction marketing, and it can be displayed on a lead capture page, where people can leave their contact details like email, phone number etc. This contact information can be used to develop further interaction, and provide your prospects with details about special offers, subscription to newsletters, and so on. This can be a great opportunity to set up a marketing campaign with the help of an auto responder service, which can work on autopilot. People are always looking for solutions, or ways to improving their income. If you provide authentic content that can help them in this regard, you can become popular in no time. Writing articles on specific topics and submitting them to article directories or posting them on blogs is the best way of getting targeted leads free. A funded proposal system is perhaps one of the best tools for attraction marketing. Instead of a free product, you offer for a reasonable price, a digital product that can be of immense value to a niche audience. This can be a training course or an information portal, where people are directly benefitted by the contents, which puts them in a better position to earn more money. You have not only created a worthwhile product that is earning you money, but it also generates additional leads, and helps in your list building. The people who buy such a product are not only benefitted by the information, but also have the opportunity to enter a program you are offering, much better prepared. Attraction marketing has a lot of scope in today’s online environment. The potency to develop techniques and tools to make the best of this opportunity is practically endless. Attraction marketing is not just an abstract concept, but also a tested method that has proved it efficacy for many successful marketers. 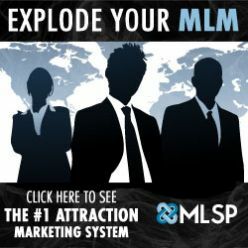 My Lead System Pro (MLSP) is considered the “Google” of Attraction Marketing systems on the Internet these days. Not only does it provide everything a good attraction marketing system should provide, but it’s also a close knit community who care about the success of others. All of the training, which is ultra high quality, is provided by its members. All of which are internet marketers and very successful online. The undeniable fact is, the most successful internet marketers all use an Attraction Marketing system. Close to 90% of them are using MLSP.